Brooks Wolfe was in trouble, but that was all he knew. It was 2008, and he was leading a group from a local paddling club on a winter run down some rapids near the Big South Fork area of the Cumberland Plateau in Tennessee. They were halfway through the daylong paddle when one of his kayakers had a panic attack. By the time Wolfe got to the kayaker, she wasn’t thinking clearly and had a rapid breathing pattern. They were far from the nearest house and even farther from medical care. The only thing he could do was get the stricken woman down the river. Wolfe maneuvered his kayak to one side of her, and another experienced paddler took the other side. Lashing the three kayaks together, they paddled through the rapids to safety. “I wonder if, that day, I hadn’t been able to help or had made a wrong decision, if it would’ve sent me down another path,” he says. “At that point, I made a decision: If I am going to do this, I am going to get some more training.” That epiphany led Wolfe to NOC. 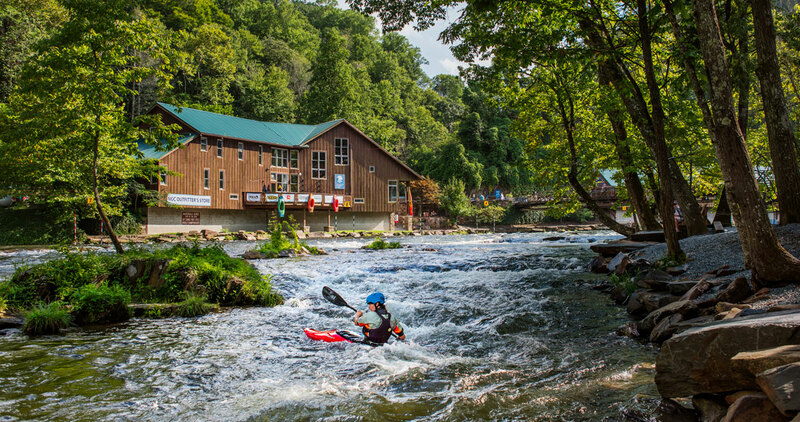 Tucked among the mountains of western North Carolina, on the banks of the Nantahala River at its intersection with the Appalachian Trail in Swain County, NOC has become ground zero for western North Carolina’s outdoor community, a place where adventurers come to learn everything from paddling to swift-water rescue to wilderness survival. But most people, Wolfe included, find much more. “Paddling is a culture, but NOC is like a family,” Wolfe says. 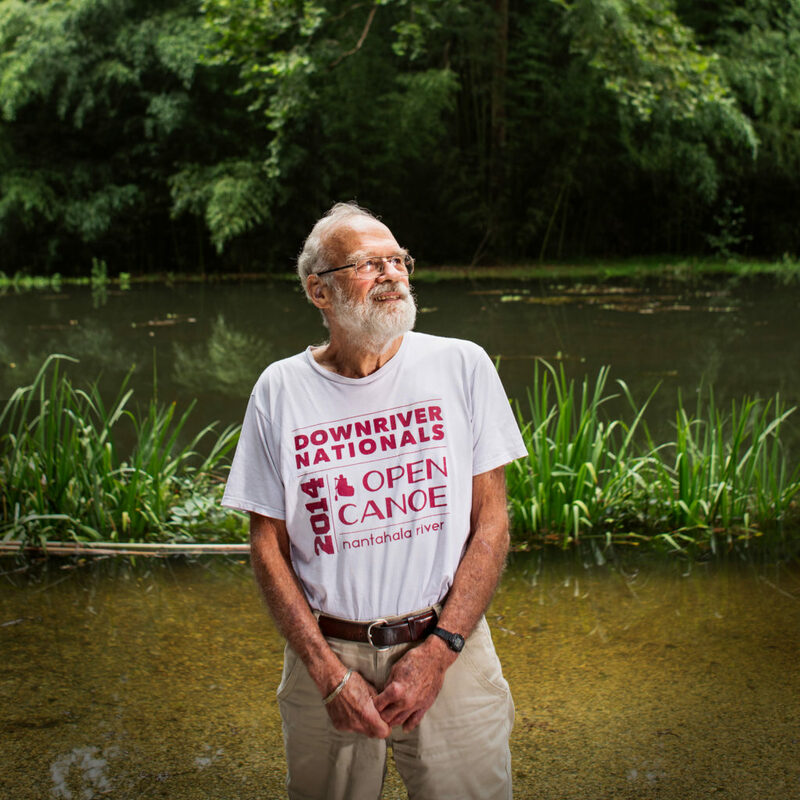 The parents of the NOC family are Payson Kennedy and his wife, Aurelia, who helped launch the center in 1972 with a pack of river-rat colleagues. Kennedy was an academic librarian at Georgia Tech when one of his paddling buddies, Horace Holden, bought a hotel and restaurant near one of the put-ins on the Nantahala River with an eye toward creating a summer camp. Holden asked Kennedy if he would oversee the venture. Kennedy agreed to operate the camp and led canoe and raft trips on the Nantahala and Chattooga rivers for the summer. But deep down, he was looking for a career change, and this was his chance. After the summer of 1972, the Kennedys moved to North Carolina for good. The first three years were pretty scary, Kennedy says. The center paid its bills, but the books always showed a slight loss at the end of the year. It wasn’t until 1975 that Kennedy felt confident that they’d survive, and then in 1980, they had their best year up to that point. Since then, NOC has grown into one of the nation’s premier paddling centers, a place where Olympians and beginners alike come to paddle. 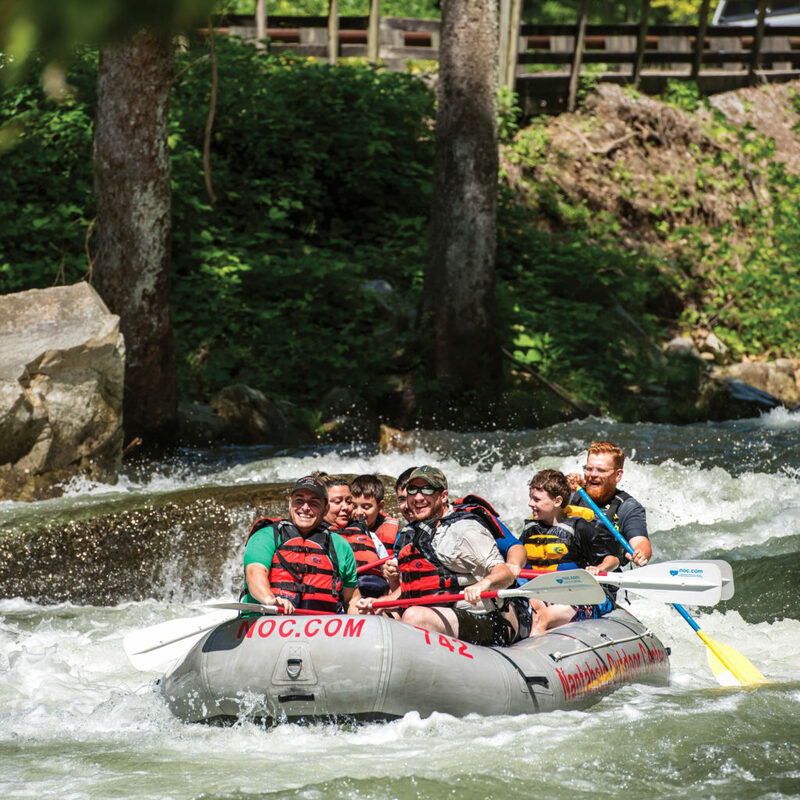 In 2016, NOC guides led the center’s five millionth guest on a white-water rafting trip. But NOC is more than paddling. “We didn’t call it a white-water center,” Kennedy says. “We called it an outdoors center. We liked to do lots of outdoor activities.” There is a ropes course. A wilderness survival and medicine school. All told, more than a million people visit NOC annually. Kennedy, now 85 years old, served as NOC president, CEO, and chief philosophical officer. He’s retired now. His wife suffers from Alzheimer’s, and he helps care for her. But he still dips a paddle in the Nantahala River now and then. For Kennedy, the business was always secondary. NOC began with an idealistic vision: paddlers starting a business so that they could go to work and do what they loved. Years later, Wolfe made that same decision. Brooks Wolfe first came to NOC in 2003 to learn how to paddle. 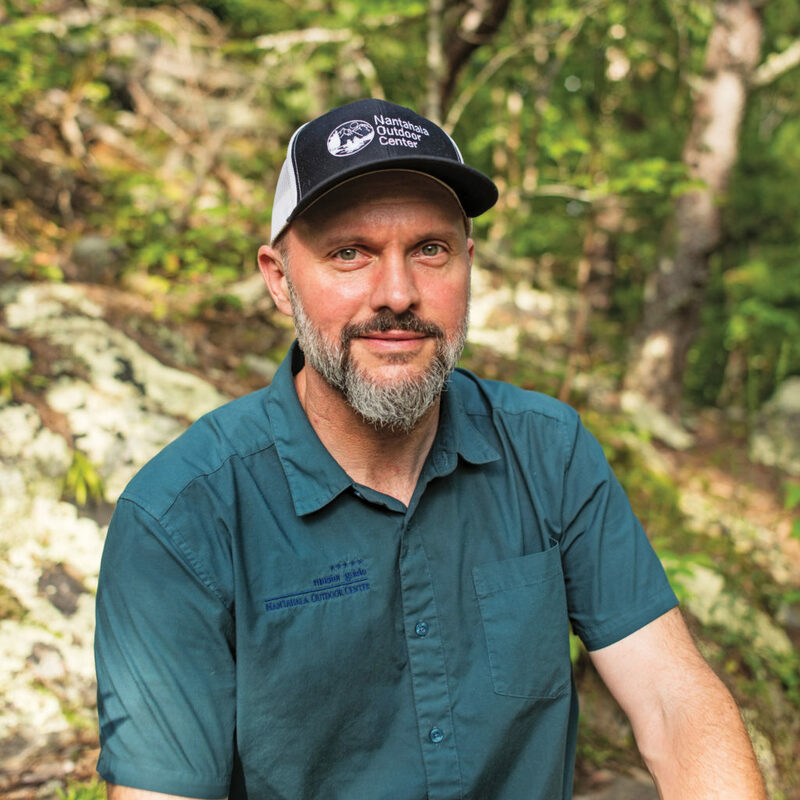 He was blown away by the instruction and returned to take more classes in wilderness medicine after the emergency on the Cumberland Plateau. Like Kennedy, Wolfe was looking for a career change. He was a corporate drone who woke every morning, put on a suit, and churned through his workday. The emergency on the river in 2008 broke the cycle. Wolfe says he learned an important lesson on the Cumberland Plateau: The beauty of nature can be deceptive. A picture-perfect day that begins with golden sunlight cutting through mist on the mountains can turn into a harrowing medical evacuation if a hiker sprains an ankle on the trail or a paddler gets hurt on the river. Quickly, terrain, weather, and darkness become factors. Wolfe has since learned how to respond to emergencies like the one he faced in 2008; specifically, he knows more about the symptoms of a panic attack and how to treat one instead of just going for help. After completing a monthlong wilderness EMT course, he left his business suit behind to lead multiday river trips on the Colorado, Gunnison, Green, White, and Dolores rivers. He also taught survival classes in southern Utah with a mission to make sure everyone — from weekend warriors to outdoor professionals — knows what to do in a crisis. Wolfe kept in touch with his NOC instructors, and when he returned to North Carolina, one of them offered him a job at the center. Since then, he has worked at NOC three different times with breaks to do woodworking or live in other parts of the country. But no matter where he went, the mountains of western North Carolina kept calling him back. So far, he hasn’t found one.